« Small in numbers, big in knowledge!! Two different states, two very different results. Coupeville grads Makana Stone and Kailey Kellner both laced up their shoes and hit the college basketball court Saturday, but only one came away feeling great. Stone and Whitman College thrashed arch-rival University of Puget Sound 80-69 in Tacoma, while Kellner and D’Youville College fell 81-49 to visiting Mt. Aloysius in Buffalo, New York. Even saddled with some early foul trouble, the splendid sophomore finished with 12 points, four rebounds and two assists in the win. The victory, which lifts Whitman to 6-1 overall, 2-0 in league play, was a chance for the Blues to make an early statement. Last year they fell twice in overtime to PLU during the regular season, then bounced back to smack the Lutes twice in the playoffs. This time around, Whitman entered ranked #8 in D-III, while PLU was #19. The Blues took the early lead, heading into the first break up 20-15, and never let their rivals get back in the game. 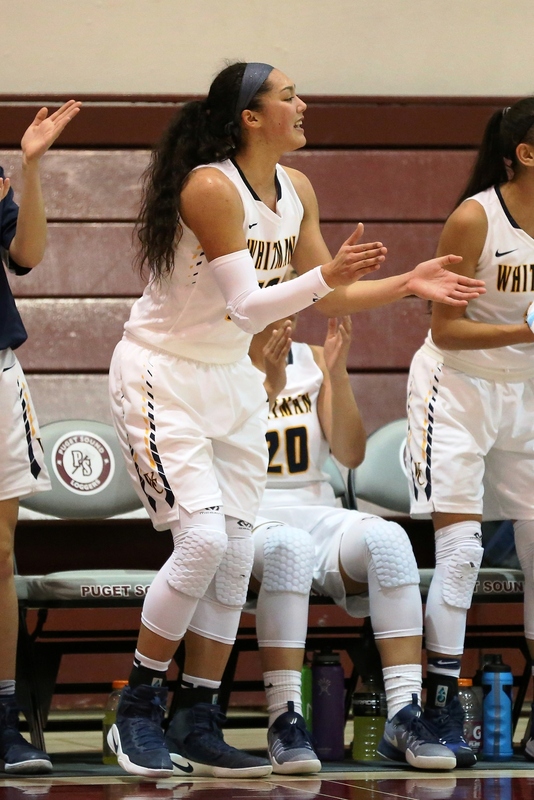 Whitman put the hammer down in the fourth, as Stone scored six of her 12 points during a game-busting run to start the period. She was one of three Blues to finish in double digits, with Casey Poe knocking down 18 and Emily Rommel tickling the twines for 16. Elizabeth Prewitt scorched the nets for 27 in a losing cause. After back-to-back league games on the road, Whitman gets a break, heading off to the Holiday Classic presented by Red Lion River Inn in Spokane next weekend. The Blues play non-conference foes Carroll College and Colorado College Dec. 8-9. Through the first seven games, Stone leads Whitman in points (100) and rebounds (45) and has shown a sizzlin’ shooting touch. She’s hitting 65% from the field (41-63) and 78% from the line (18-23). D’Youville had a two-game winning streak snapped thanks to wildly inconsistent scoring. The Spartans held their own with Mr. Aloysius in the first (17-16) and third quarters (12-12), but were buried in the second (28-11) and fourth (24-10). The loss drops D’Youville to 2-5 overall, 1-1 in league play. Kellner, despite starting for the fourth-straight contest, didn’t get much of a chance to make a difference as the Spartans coach juggled lineup looks all game in an effort to see what his bench could accomplish. The former Wolf pulled down a season-low eight minutes, missing the only shot she put up. She and her teammates get right back at it Monday, when they hit the road to face Buffalo State.